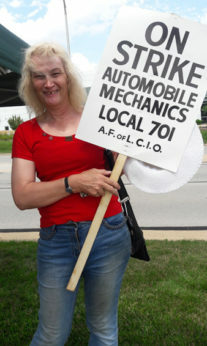 NAPERVILLE, Ill. – Leaving their toolboxes inside, striking auto mechanics turned to other tools to rev the engines of solidarity outside scores of car dealerships lining Aurora and Ogden Avenues in this Chicago suburb August 1. Nearly 2,000 Chicagoland mechanics – highly skilled technicians – hit the bricks after an impressive 1221–169 strike vote last weekend. The techs are employed by 150 dealerships in the Greater Chicago area according to a flyer issued by Machinists Local 701. Wages, hours and fair treatment of young workers were the main issues raised by workers on the picket line in interviews with People’s World. 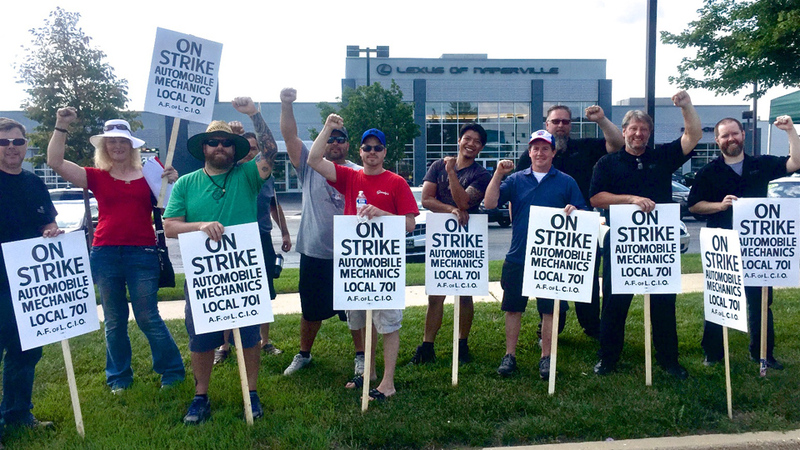 “I’m out here standing up for the youth,” said Chad Michael Gallois, a mechanic from the Naperville Lexus dealership. In the last contract, negotiated under pressure in the downturn following the 2008 economic crisis, the apprentice program was seriously undermined, several mechanics said. 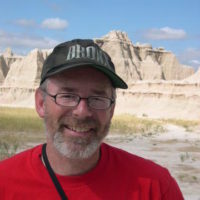 Jim LeCroy, 47, started his career as a mechanic at Lincoln-Mercury in 1994 and has been at Lexus for eight years. “Back then, you started as an apprentice, you learned the trade, older guys showed you and after four years you became a journeyman,” he related. But now, according to LeCroy, many come to work having amassed $30,000 or $40,000 in student loans going to trade school for a couple years. “It’s a lot harder for these younger guys to move up. They’re put to work by the dealership as lube techs, with no guarantee when they can start the apprentice program.” The apprenticeship itself has been extended from four years to eight years. The mechanics speak with great pride about their work. Working on cars today is a high-tech job. Some cars come with 60 separate computers, says Sanecki. Each computer has its own full set of error codes, each has its own diagnostic protocol. And each has to communicate with a network, which can have its own issues. The technicians learn to use oscilloscopes to diagnose wave forms on the network. 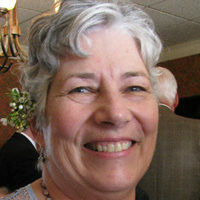 “In effect, we have to be electrical and computer engineers,” says Sanecki. Mechanics invest tens of thousands of dollars of their own money on tools, which are increasingly expensive, adds BMW mechanic Govreau. Mechanics sacrifice their rest time and family weekends to meet the dealers’ schedules. Everyone is off on Sundays, but for most, the other day off is scattered throughout the week. “The split-shift is a crime” for people who work hard and need their rest, says Rautenkranz. 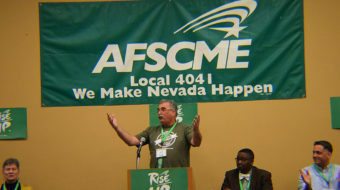 Govreau says health care is so important to the strikers because, “it’s an industry where we’re tearing ourselves up. On a daily basis you’re cutting your hands up, throwing your back out when you pick up heavy objects, arm injuries, muscle pulls. It’s mostly back issues. We’re standing up the whole time. It’s gotten to the point where you can’t be in this industry for very long. You only have a certain amount of shelf life before you can’t physically do it.” Govreau explains the older workers who manage to stick with the industry find that dealers don’t like having them around and are looking for ways to push them out. Spirits were high on the Lexus picket line. The 22 mechanics were joined by the dealership’s entire Parts Department and two porters, members of Teamsters Local 731. The porters provide the lifetime of free car washes the dealership offers with new car purchases and it wasn’t clear if it was going to be left to the managers to get their hands wet delivering the promised scrubbing while the porters joined the picket line. Parts man Key Toledo, 47, remarked that their union contract expires next year and they look forward to the mechanics’ solidarity then. Technician Jesus, 40, who declined to give his last name, brought along his own playlist and speakers, blasting Def Leopard from the shade under the tent provided by one of the workers. He reported seeing customers drive in and drive right back out. “Customers don’t want unqualified folks even doing their oil changes,” he said. Meanwhile, around the corner, Sanecki, a veteran of three strikes – 1979, 1981, and 1994, he proudly reports – redirected a truck with a full load of Lexuses and Toyotas that was getting ready to turn into the driveway. “You can’t cross this line,” Sanecki said he told the driver. “We have Teamster guys on our line.” When the driver pleaded he was from Detroit and he didn’t know where to go to unload, Sanecki gave him directions to a nearby vacant lot. “I’ve been 40 years in this business, I’ve been on some strike lines,” Sanecki explained. 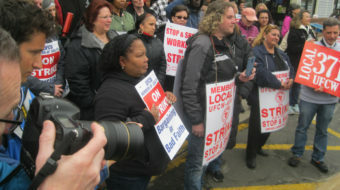 The first day of the strike had turned into solidarity day in Naperville. The slick commercial strip had taken on an entirely new character as dozens of clumps of workers with picket signs – workers who normally do their work out of sight – became the human faces of Ford-Lincoln-Mercury, Cadillac, Nissan. Subaru, BMW, Lexus responding to honking horns of their customers and community.